Vivienne Shark LeWitt’s small paintings are considered, intimate and dreamily elusive. When they first appeared in the early 1980s – when everyone was scaling up to monumental canvases – they seemed regressive or literary, replenishing the old allegorical tradition of painting (for example, the Renaissance Italian Sandro Botticelli’s ‘La Primavera’ 1477–78). Allegories often underscore the literal sense with a symbolic meaning. Characters or situations represent Fortune or Peace or Vice or Decadence. By contrast the message or narrative in LeWitt’s vignettes look more cropped and enigmatic. 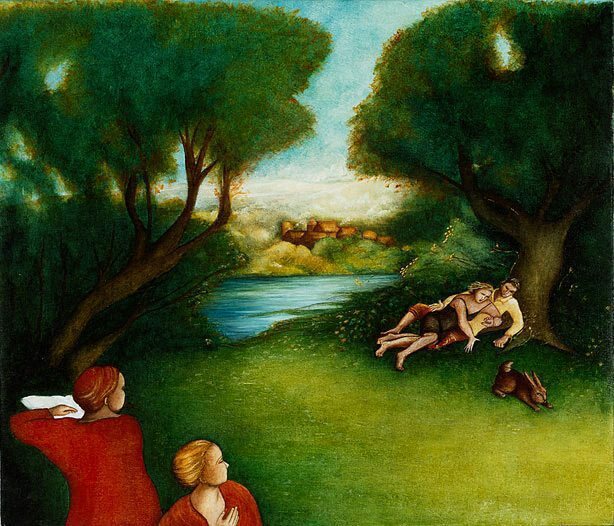 In the contemporary world, the retrieval of those messages is less assured than in Botticelli’s day: our coded meanings are more ambivalent and uneasy, while the narratives leave you suspended with no sense of closure. LeWitt’s images (and titles) create a distance, often in the form of an irony, between the quiet oil-on-linen technique and the struggle for resolution (see, for example, the exchange of looks between a barefooted woman in a smock and a bear she takes on a walk along a beach in ‘Shall I bark for you master? Or shall I bite? Ha, ha, ha’ 1987). LeWitt’s ironic allegories set up a tension where the desiring self finds itself isolated by the dread of being misrecognised by someone else, like that stand-off between bite and bark, or between image and title. Sometimes that tension is poisonous but more often it is droll. Since the 1980s LeWitt’s work has shifted away from the medieval symbolist look, to scenes of domestic suburban life reminiscent of 1950s cartoon style illustration, but again with a lemon twist. In ‘The omen, ‘That wascally wabbit’’, modern figures materialise in an elegant 18th-century context, recalling the idyllic scenes painted by rococo artist Jean-Antoine Watteau. The focus of the comp-osition – the luminous rocks, lake and sky – is in the middle distance: a metaphorical space of obscure longing. While the two figures in the foreground are gazing – in the vein of the melancholy sidelong looks to be found in Watteau’s ‘fêtes galantes’, his dreamy parkland settings where amorous dalliances or enigmatic exchanges were enacted – towards the lovers and the somewhat ominous ‘Alice in Wonderland’ rabbit which is escaping down the axis of the composition as if it is about to disappear stage right. That ‘wascally wabbit’ is sacred to Eros, and mischievously enough, will catch your attention, while also escaping it. George Alexander, Contemporary: Art Gallery of New South Wales Contemporary Collection , 'Popism and screen culture', pg.204-245, Sydney, 2006, 238, 239 (colour illus.). Anthony Bond and Victoria Lynn, AGNSW Collections , 'Contemporary Practice - Here, There, Everywhere ...', pg. 229-285, Sydney, 1994, 276 (colour illus.). Review: works by women from the permanent collection of the Art Gallery of New South Wales , "Women Artists in the Contemporary Collection", Victoria Lynn, p13-15, Sydney, 1995, 15, 26.